Posted on February 3, 2010	by Michael Gorton, Jr.
EDIT: After this post, John Medolla from Medolla vineyard was in touch with me. He wanted to let me know that their website is back on-line after a technical glitch. Please go to Medolla Vineyard to find out a little bit more about them. 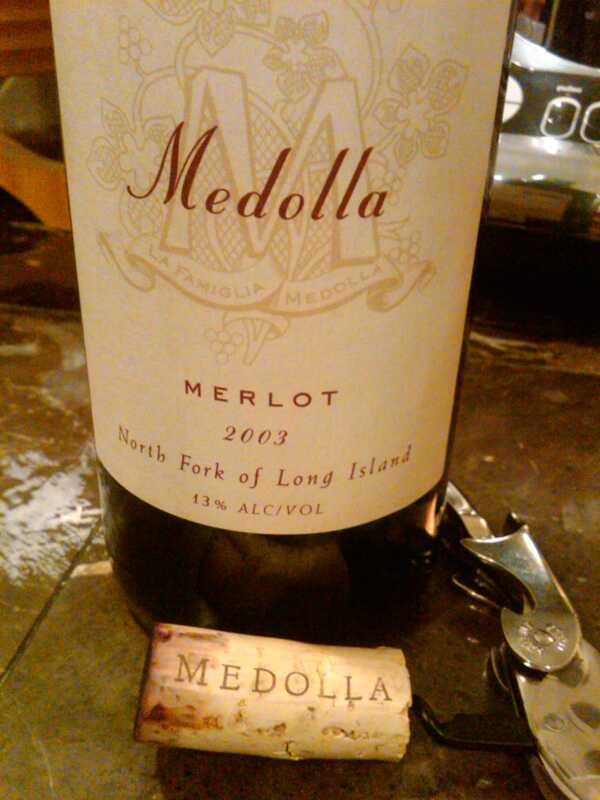 This month, in the New York Cork Club shipment, arrived a bottle of Medolla Vineyards 2003 Merlot. I have never heard of them, and never tasted their wines. So this was very exciting. Not to mention that is was a few years old and released last year. Then, I was excited to see that this part of Palate Press, the online wine magazine’s own, “Wine for Haiti“. Vineyards around the country donated cases of wine or special releases of their wine for auction. The proceeds of the auction would be sent to aid the people of Haiti. There are alot of great offers, some cases at half price! So I figured that since I just got a bottle of this, I would taste it and let you know whether you should put a bid on this case. I just did, but let me share my tasting notes so that you may consider bidding on this wine. Upon opening, you could smell that this was going to be a fun wine. On the nose I was picking up this wonderful funk. It was earthy with a slight touch of barnyard, in a very good way. There were elements of dried cherry and black cherry with notes of toffee and oak. The taste of the win e was even more interesting. There was some oak up front, but it dive give way to some cherry, tobacco and some fresh espresso. The tannins were chewy and left a very dry finish. Added to the finish was a soft and subtle vanilla note at the end of the finish. I could not find too much information about Medolla Vineyards, as it seems that their website is no longer running. But you can buy their wines at The Tasting Room in Peconic or from a here. Medolla Vineyards is a small producer, maybe the smallest on Long Island. They only produce 500 cases of wine a year, just about 20 barrels’ worth. They hand harvest the grapes and press the wine and age it at Lenz Winery in Peconic. They only produce Merlot. The Medolla’s first vintage was in 2002 and this is their second release. They pay homage to John’s grandmother who came over to America from Italy in 1913, so continued the tradition in Brooklyn. Today, the Medolla family carries the torch and makes a wonderful wine that stays true to Long Island and true to the Medolla family tradition. Or even better, you can bid on a case and help support the people of Haiti and get some excellent everyday drinking wine from a small producer on Long Island. This wine is a fantastic value. At $15 a bottle, it truly is a great everyday drinking Merlot. I had mine with some bleu cheese and some goat cheese on some crusty French bread with some turkey soup. It went perfectly. Now go place a bid! This entry was posted in 2003, Long Island, Medolla Vineyards, Merlot. Bookmark the permalink. sonds like a good wine…..If you get a case i will buy a bottle or two from you. Thanks Dad…I’ll see about getting my hands on some even if I don’t win the lot…really good stuff. Now that I have turned you into a Merlot fan!